Wisconsin cheese curds never met a frown they couldn’t turn upside-down. 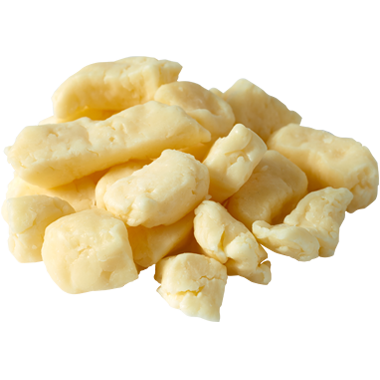 Springy and fresh and famous for that adorable squeak, cheese curds are just flat-out fun! For one, they give you an eye into the magic of cheesemaking, since all cheese starts by separating the curds from the whey. They are also tiny and funny looking with no two alike. Batter and fry the curds, throw them on top of fries and smother them in gravy, like our neighbors to the north do. Or, just enjoy them fresh, as is. You can’t go wrong with this irresistible Wisconsin original. The fresher the better when it comes to Wisconsin cheese curds. They’ll keep for several days but, trust us, they’re best within the first 24 hours after they’re made. We’re happiest tossing back a frosty light pilsner, lager, pale ale (or two!) with a serving of salty, fresh Wisconsin cheese curds. You might as well go ahead and order a pitcher. The best way to enjoy cheese curds is to either batter and fry them, or serve them as poutine. Poutine is a French-Canadian dish of French fries and cheese curds smothered in gravy. We like them straight-up served at room temperature too. Curds are idiot proof -- they always have your backs, so you really can’t go wrong.